28th November 2008. In this Issue: Welcome to our Christmas Catalogue Edition of the ExplorOz Newsletter. With our broad range of categories, we're sure you'll find the right gift for someone - or even yourself. The festive season has arrived so this is a special Christmas edition newsletter from the ExplorOz online shop. The ExplorOz shop offers some great gift ideas for everyone, as well as products to help you get the most from the summer holidays. Get all your Christmas shopping done without leaving the house, and help your friends and family enjoy their holiday break in Australia’s outdoors. 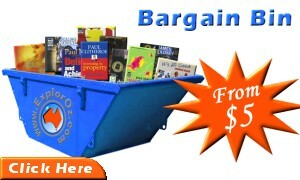 Our Christmas bargain bin has also been added as a new category to the ExplorOz shop. You’ll find some fantastic gift ideas with prices starting at just $5.00. But hurry, this offer is for current stock only. Found something special for you? Don’t forget we offer a “My Wishlist” function - simply browse for products that you would like to receive then click “Add to Wishlist”. You can email your Wishlist, along with a message, to anyone. We hope you find the following gift suggestions useful, and the normal ExplorOz newsletter will be back next fortnight. We recommend selecting the Express Post shipping option for all Christmas Gift purchases, to ensure a minimal delivery time. We also suggest that December 19th should be the last day for purchasing Christmas orders.